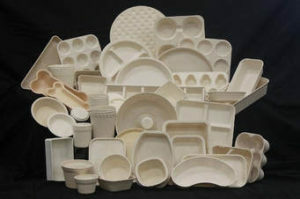 Biodegradable products made by Chamness. A manufacturer of compostable packaging is moving its operations from California to Iowa. Jon Kallen, spokesperson for Chamness Biodegradables, says Iowa’s “business climate” is the main factor in the company’s decision to relocate from Camarillo to Ankeny. “This company uses a lot of energy to make the products and we’re paying about 21-cents a kilowatt hour for electricity in Southern California. We’ll probably pay around 6-to-7-cents a kilowatt hour in Ankeny,” Kallen told Radio Iowa. Gary Chamness, the owner of the company, is a native of Blairsburg in northern Iowa’s Hamilton County. Kallen expects the new facility in Ankeny will eventually employ 36 people. “The jobs are going to be in research and development, sales, production, and custom fabrication because for a lot of these materials you have to make molds,” Kallen said. Chamness Biodegradables makes serve-ware and bakeware, and according to Kallen, the company’s customized packaging division is booming. We make a myriad of packaging items for clients, including six-pack beer ring holders, test tube holders for laboratories, we make packaging for a national pizza home delivery company, and we provide all the packaging for a company that delivers home meals,” Kallen said. The Iowa Economic Development Authority Board, on Friday, awarded Chamness with $140,000 in direct financial assistance and tax benefits. Chamness plans to lease a 27,500 square foot building in Ankeny.